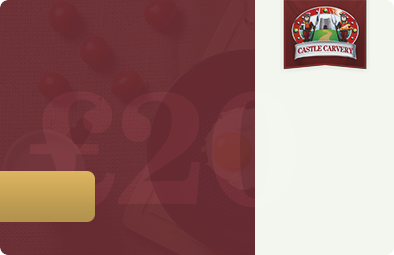 The Castle Carvey Gift Card, the perfect gift for family, colleges and friends to spend and enjoy. Just click the PayPal Add to Cart voucher button to start your order in 3 easy steps. You can select the amount you wish to purchase on the PayPal* screen in £10 or £20 increments. All Gift Cards will be sent via Royal Mail. We recommend you order before the 18th of December to receive your gift cards before Christmas. * PayPal will open in a new window. If you wish to purchase more than one card please purchase one at a time.